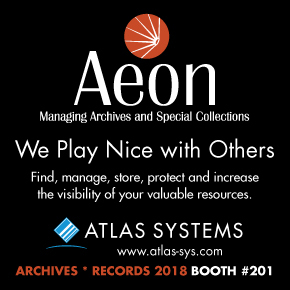 Congratulations on being selected to speak at ARCHIVES * RECORDS 2018, where you’ll make a presentation to a room full of eager listeners in one of 70 sessions. We invite you to consider sharing your presentation with an even broader and more diverse audience by also submitting it for publication consideration in one of several outlets available through SAA. Check these out! American Archivist is the leading publication in the archives field. Although an oral presentation is different from a written article, if you think of both as you prepare, transforming your presentation into a journal piece follows naturally, with the additional benefit of feedback from the session chair, fellow speakers, and questions from the audience. Journal articles reach 8,000 words for research articles and surveys, and 3,000 words for case studies and perspectives. Photographs and other illustrations may also be included. For example, Mark Custer’s “Mass Representation Defined: A Study of Unique Page Views at East Carolina University,” which started as an SAA Annual Meeting presentation. The journal also welcomes papers that blend the shorter presentations from a panel into a longer paper with citations and additional commentary. Click here to learn more about the journal’s editorial policy or contact the editor CHRISTOPER (CAL) LEE. Archival Outlook. SAA’s bimonthly magazine features 700- to 1,400-word articles on best practice, how-to pieces, how archives are used by the public, and archivists on the job. Photos are encouraged. Check out these presentations from the 2015 Annual Meeting that were converted to articles: "Connecting with the Broader Community" by Jeremy Floyd (originally a professional poster) and “Big Web, Small Staff: Web Archiving with Limited Resources" by Kelli Bogan, Rebecca Peterse, Rachel Taketa, and Kristen Yarmey (originally a panel session). For more information, contact the magazine’s coordinator ABIGAIL CHRISTIAN. Book Publishing. Since the 1970s, SAA has published more than 150 digital and print publications. You can help build on that history by submitting a prospectus for a book-length manuscript. Or consider the Trends in Archives Practice, an open-ended series of modules featuring brief, authoritative treatments (10,000 to 20,000 words in length) that fill significant gaps in the archival literature. Ideas welcome! Click here for more info or contact Publications Editor CHRIS PROM. “Write Away” Breakfast Forum: An informal discussion with Publications Editor Chris Prom, American Archivist Editor Christoper (Cal) Lee and Reviews Editor Bethany Anderson, and SAA staff Teresa Brinati and Abigail Christian on how you can contribute to the professional literature. “Office Hours” in the Exhibit Hall: An opportunity to chat with American Archivist Editor Cal Lee, Publications Editor Chris Prom, and Dictionary Working Group Chair Rosemary Pleva Flynn.